For Mike Mayock, and for draftniks. 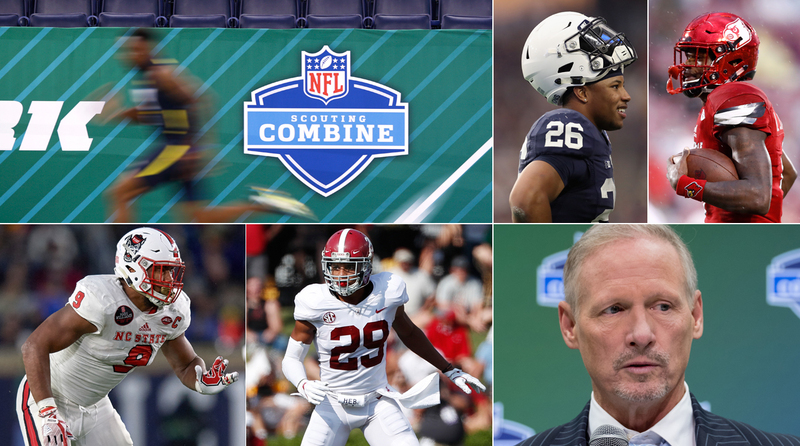 Starting Friday at 9 a.m., NFL Network will show about 36 hours of live on-field combine coverage over four days from Indianapolis. ESPN will be on the air from Indy for big chunks of the weekend too. I caught up with Mayock over the weekend as he took a break from tape study. He educated poor, pitiful me as I played catchup on the college names and the 2018 draft. I’m probably not the only one who has never seen a snap of Leighton Vander Esch, so step into the combine classroom. Professor Mayock is at the podium. In the 18 drafts this century, only three guards have been picked in the top 10: Brandon Scherff (Washington, 2015, No. 5) and the seventh and 10th picks in 2013: Jonathan Cooper (Arizona) and Chance Warmack (Tennessee). Scherff’s a star. Cooper and Warmack have been major disappointments. • 2015: Amari Cooper, Kevin White, DeVante Parker, Nelson Agholor, Breshad Perriman, Phillip Dorsett. • 2016: Corey Coleman, Will Fuller IV, Josh Doctson, Laquon Treadwell. • 2017: Corey Davis, Mike Williams, John Ross. Wow. Is that awful. One of 13 has played like a first-rounder. Amari Cooper. One! “I think there is some trends emerging,” Mayock said. “It’s a pass-first league. Who were the best rookie wide receivers last year? JuJu Smith-Schuster and Cooper Kupp, taken at 62 and 69 [overall, respectively]. If you look back since '14, at all the first-round receivers, there is a history of injury problems—guys who can’t answer the bell and most of them had that history in college that we didn’t pay attention to. All three of the ones last year—Corey Davis, Mike Williams and John Ross—had durability concerns coming into last year’s draft. And I’m not saying they can’t become great players, because it typically takes a couple years at that position. I’m just saying, hey, beware of a history of injury at that position. Take a look at drafthistory.com and go back and look at those four or five draft classes. Please, please, please do not think opinions are final 60 days before the draft. That’s how far away from the first round we are. Mayock: “Last year at this time, DeShone Kizer was my top-rated quarterback.” Things changed. By the time the draft rolled around, Mayock didn’t even have Kizer in his three-QB first round mock. • My guests on The MMQB Podcast With Peter King this week are Mayock and ESPN’s Todd McShay. The podcast drops early Wednesday morning. Strongly recommended for some fervent opinions (on Lamar Jackson, Josh Rosen and Baker Mayfield most notably). • NFL Network will have 52 hours of live coverage from Indianapolis, starting Wednesday. The four days of coverage of on-field stuff commences at 9 a.m. ET Friday and runs through Monday. Friday workouts will be running backs, offensive linemen and kickers; quarterbacks, receivers and tight ends go Saturday; linebackers and defensive linemen work Sunday; defensive backs work Monday. • ESPN will do “NFL Live” from Indianapolis on Wednesday, Thursday and Friday from 1:30 to 3 p.m. and add significant coverage on “SportsCenter” each night of the combine. News item: Kansas City agrees to make its second major trade in a month, dealing Pro Bowl cornerback Marcus Peters to the Rams. The Chiefs reportedly traded the 25-year-old along with a 2018 sixth-round pick for a ’18 fourth-round pick and a ’19 second-round pick from Los Angeles. Check down further in the column for my Stat of the Week, but you’ll see why Peters’ value was still high, though tarnished in Kansas City because of his anthem stance (he kneeled, much to owner Clark Hunt’s chagrin), his unpopularity in the arch-conservative area because of his anthem protest, and his one-game suspension after blowing up and throwing a penalty flag in the stands at the Jets. The man averaged 9.7 big plays (interceptions, forced fumbles, recovered fumbles) a year in his three Kansas City seasons. It seems like a perfect fit for the Rams, too, at an unbelievably good price: a low third-round pick, at most this year, and they get in return a player under contract for two years and $10.5 million. Peters should thrive in a Wade Phillips defense that asks its top corner to play head-to-head against great receivers. If the Rams can coax Peters into buying into their way of doing things, this will have been a smart purchase. Maybe the Chiefs couldn’t have made this work, and maybe coach Andy Reid figured Peters was just too much of a handful. 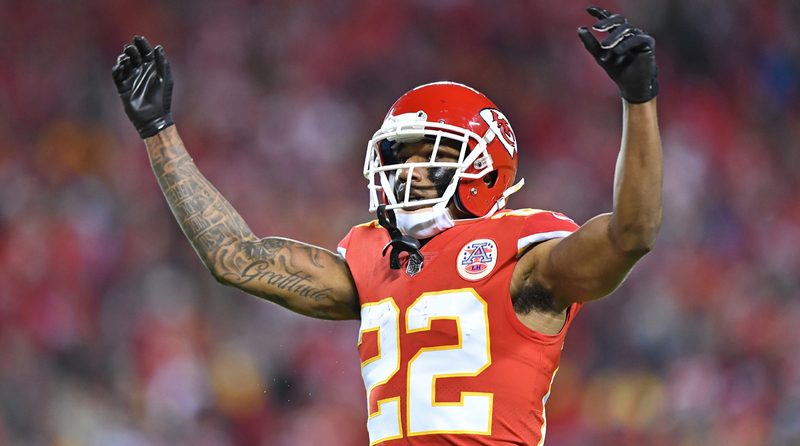 But if the Chiefs don’t get a first-rounder in return for a 25-year-old cornerback who, if he can control his temper and play within the scheme, could be a Hall of Fame player, I like the deal for Los Angeles, risk and all. I’m told there was no agreement or even “we’ll see” about redoing Peters’ contract, so the Rams will have to count Peters only $1.7 million against the cap this year. With the Rams’ biggest need being at cornerback, and with Peters surely understanding this season will be huge in figuring the value of his next contract, the Rams are likely to get the very good Peters—and in an area where the anthem protests do not roil the locals the way they do in the Midwest. The Niners were also in play, and the Browns, too, to a lesser degree. But here’s what’s interesting: The Rams, 49ers and Browns are all on the Chiefs’ 2018 schedule. L.A. and Kansas City will play in Mexico City this fall. Peters might be a little fired up for that game. If you’re an Olympics nerd like me, you may have seen the clip on NBC of the 6'6", 310-pound man lifting up the 5'2", 126-pound woman hockey player after the United States’ thrilling 3-2 shootout victory over Canada in the gold medal game in South Korea on Thursday. And so, like any good fiancé would, Schofield worked his way down to ice level, climbed over the boards and lifted Coyne into the air in celebration. And NBC caught the two lovebirds, who went to the same 4,000-student high school in suburban Chicago (Carl Sandburg) but didn’t meet until they spied each other working out post-high school in a local gym. On Sunday, Schofield was back at his home in Illinois, considering what he’d seen. “USA-Canada is such a fierce rivalry in women’s hockey,” he said. “I suppose maybe when I was with the Broncos and we’d play New England would compare, especially the year we beat them in the championship game to go to the Super Bowl. That was intense. But this … this was just so different. When I played in the Super Bowl, I represented the city of Denver. The Super Bowl is obviously the biggest game we play, but it happens every year. Kendall represented the United States, her country, and just imagine—she trained every day, basically, for four years to prepare for this one game. I mean, you prepare for the Olympics, and that’s more than one game. But everyone knows it’s going to come down to the U.S. and Canada for the gold medal. Since 1998, we’re the only two countries to win gold at the Olympics. Afterward, Schofield marveled at the weight of the medal. “It’s heavy,” he said. “What did Kendall say about her medal?” I wondered. “‘I can’t believe it’s so gold,’” she said. Now Schofield has a couple of weeks to prepare for the rest of his NFL life. He’s a free agent. You’re forgiven for going to South Korea for the gold. Last week, Sports Illustrated had a strong #MeToo exposé ​by L. Jon Wertheim and Jessica Luther of misconduct inside the Dallas Mavericks’ front office. The story roiled the basketball world. “It’s not something we tolerate,” Mavs owner Mark Cuban said in response to the allegations of abuse. RT @GolfLogsdon: Is UFL on tv anywhere? ... HD Net, whatever that is. I’m not a TV head. I truly did not know what HDNet was. It turned out HDNet was a channel owned by Mark Cuban. RT @mcuban: Just because you are clueless doesnt mean everyone else is Peter. Is SI still in business ? ... Nice to meet you, Mark. Sports Illustrated was still in business on Oct. 10, 2009. Sports Illustrated is still in business eight-and-half years later. —Jacksonville quarterback Blake Bortles, after signing a three-year extension, through 2020, with the Jaguars on Saturday night. —Jaguars executive vice president Tom Coughlin, on the signing of Bortles. —Former New York Giants director of player evaluation Marc Ross, fired by new GM Dave Gettleman in January, on the first-round Louisville prospect, in an ESPN appearance Thursday. —Darrell Bevell, Russell Wilson’s offensive coordinator for the first six seasons of his Seattle career, to Robert Klemko of The MMQB, on Oklahma’s first-round quarterback prospect, Baker Mayfield. —Oakland coach Jon Gruden, to S.L. Price in his superb Gruden profile in Sports Illustrated. *Tillman missed 8 games in 2004, his second season. So I used 2003, 2005 and 2006. Peters is 25. As you can see, no cornerback in this era of the NFL has created turnovers and fumbles in his first three seasons at the rate Peters has. Please join me and my friends from The MMQB and other media Friday night in Indianapolis at one of the coolest places in the country to have a beer and talk—Sun King Brewery in Indianapolis. From 7-8:30 p.m., we’ll take your questions and let you buy us a beer. Tickets are $25, and all proceeds go to Midwest Food Bank. Per our organizer-in-chief, Angie Six, you can find tickets here. We’d love to see you Friday night. That’s gonna be so moving when the Russian hockey players visit the White House. $16M is a lot for a slot WR but Landry's been the Dolphins best & most consistent offensive player. Hard to argue they'd be "better" letting 112 recs & 9TDs walk. I propose a duel at 10 paces, with the weapon of choice being a coaches’ clicker, between Greg Gabriel and Ross Tucker. From the new season of “The MMQB Podcast With Peter King,” available where you download podcasts. 1. I think the three-year, $54-million extension signed by Blake Bortles on Saturday night in Jacksonville is smart for both sides. But understand that the contract really doesn’t bind Bortles to Jacksonville for much more than the 2018 season. The Jags had the ability to bring Bortles back for his fifth season in 2018, at $19.05 million guaranteed. Instead, with the new deal, they bought two more seasons for essentially $7 million more guaranteed, plus cap-friendly salaries for 2019 and 2020. In other words: If the Jags let Bortles walk after 2018, they’d still owe him $7 million. But by doing the contract, they buy two years of quarterback security if Bortles plays well in 2018. So I like the deal for Jacksonville. Plus, as Adam Schefter reported, the deal lowers Bortles’ cap charge to $10 million in 2018, important for a team that has about $30 million in cap room, which isn’t much. 2. I think this is also a smart deal for Bortles. It’s simple: The Jags liked him more than anyone else on the market did. No one else was going to hand him a starting job on a strong playoff contender. Instead of playing out his franchise-tag year, he gets more guaranteed money, plus some but not a lot of security … and he knows the coaches, knows the scheme, showed flashes of playing the best football of his NFL life as this season wound down, and did it with a cast on offense that was pretty beat up. 4. I think I won’t understand it if the Cowboys keep Dez Bryant and pass up saving $8.5 million in cap space on a declining 30-year-old receiver. It’s smarter, for many reasons, to cut him. 5. I think, if you ever want to know the lengths to which NFL players go to play in games (and a cool way to show how things have changed in media and training terms in the last 20 years), you should read this Jenny Vrentas story from The MMQB. • Jimmy Garoppolo’s deal with San Francisco averages $27.5 million a year. • Garoppolo had started seven NFL games, and the 49ers had no competition for his services. • Cousins is 29. Over his past three seasons as Washington’s starter, he has averaged 4,392 yards passing and a 97.5 passer rating. Assuming Drew Brees re-signs with New Orleans (an assumption, but not a given), Cousins will be far and away the best quarterback on the market, with at least eight teams starved for a quarterback of the future. • Three of the teams most desperate for a long-term starter—the Browns, Jets and Vikings—have an average of $77 million in cap room entering free-agency. If the Jets want Cousins, which is a given, do you think they’d actually draw the line somewhere, anywhere, shy of getting their man? • One asterisk: Cousins may decide he wants to go only to a team ready to win now. Say he decides his best option is Denver. (The Broncos, according to overthecap.com, have $26.8 million in cap room.) I doubt Cousins will say he has to make as much in Denver as the highest bidder, if he has his mind set on the Broncos. To me, that type of scenario is the only way he doesn’t end up at $30 million annually, or north of that. 7. I think, not that it’s a terrible decision, but I’m not too crazy about the Panthers planning to franchise-tag Graham Gano. Good kicker who had a very good year last year (29 field goals, 30 attempts). In the last three years, Gano has missed nine PATs and is 5-of-11 from 50-plus yards. Now he’s a $4.96 million player. Seems excessive to me. 8. I think what I appreciated about former Jets and Patriots linebacker David Harris—the second-leading tackler in Jets history—is that he was a very good player and the exact same person from the start of his career to the end. He retired the other day, letting a statement released through his agent be his only words on the subject. I am fine with players being anything they want to be, as long as they’re themselves. And Harris was a private person and intensely competitive player, admired by so many coaches and teammates. Good for him to go out on his own terms, with very few syllables. 9. I think the idea of arming teachers obviously is a hot-button topic of the week. Since I have not been a teacher, I asked two of my media peers—Michael David Smith of Pro Football Talk and Bleacher Report’s Mike Tanier, both of whom used to teach—what they thought of the idea. a. Story of the Week: by Florida hospital radiologist Heather Sher, in The Atlantic, about the shocking injuries from bullets she saw from the Parkland victims. c. Column of the Week: from the New York Post, by Ralph Peters, “I’m a military man and I think we should ban assault weapons.” Interesting piece. d. I can’t help but think of the thoughts that must be going through the minds of so many students in Parkland, and in so many other school districts in America, after so many adults on every level failed to keep them safe—after the FBI failed them, after the sheriff’s deputy chickened out and didn’t enter the school, after the governor of Florida failed them, after the state politicians in Florida failed them, after Sen. Marco Rubio failed them, after the NRA whackjobs failed them, and after the president of the United States time after time after time failed them. Here’s what I’d be thinking: Okay, the adults have proven they’re incompetent to handle the big stuff. We’re going to have to hit the streets. e. Hit the streets, kids. We’re behind you. g. Blame, blame, blame, blame. Blame anything but the guns. Innocent bystanders, those guns. h. Listen to Loesch and the NRA, and you get it drilled into you that there are six or eight causes that add up to 100 percent of the reason for the type of gun violence that resulted in the killing of 17 people at the school in Parkland, Fla., 12 days. The gun itself was responsible for 0.00 percent of the reason, the same way it was responsible for 0.00 percent of the murders at Sandy Hook Elementary School, and 0.00 percent of the murders at the country music concert in Las Vegas. i. This cannot be the norm in the United States. We cannot allow it to be the norm. Deep breath. j. More to come soon to The MMQB on the Jonathan Martin story. We dispatched a writer to southern California to learn more about Martin and this recent incident. Stay tuned. k. Coffeenerdness: The inconsistency at Starbucks is somewhere between noticeable and maddening. Peets, or a local expansion of Gregory’s, needs to make New York inroads. Competition would make everyone better. l. Beernerdness: This headline on a Travel and Leisure story is quite exciting: “A new craft beer hotel will have a tap in every room … and cold beers in the shower.” That’s what I call nirvana. m. I love the Olympics. So glad they come at a time when I’m ready to veg out in front of the TV for hours. n. Praise to both Russian women’s skaters. Evgenia Medvedeva, silver winner, and Alina Zagitova, the gold medalist, were brilliant, and artful to see. I thought Medvedeva, for the sheer breadth of her skills and art of her skating, was slightly better. Zagitova won, in large part because of the crazy rule that rewards skaters for attempting their jumps in the second half of the free skate—when, theoretically, they would be more tired. I get the spirit of the rule, I suppose; if you’re great when you’re fatigued, that is a bonus. But why would a skater who hadn’t attempted anything difficult for 135 seconds be rewarded for then jumping around a lot in the last 135 seconds? It’s dumb. o. Mirai Nagasu, the American skater who said after bombing out of the free skate that it was her audition for “Dancing With the Stars,” has apologized after realizing what an idiot she sounded like on the biggest stage of her life. You trained for years and years and years to make the Olympics, skated lousy, and instead of saying, I skated lousy, and it’s all on me, you’re a fountain of excuses. Too much time taken for the lunar holiday, too many cold/lukewarm showers, too much steam taken out of her with the team competition … Man, so wonderful to have you take up one of three spots in the competition that skaters all over the world skate their lives for, Mirai. Have a good life. p. Nothing but class, Patrik Elias. Glad to see your number retired by the Devils. q. Billy Graham, who died last week, preached for 69 years. Preached in person to 210 million people in 185 countries. Queen Elizabeth is on the verge of comparison, but it’s likely no one on earth in modern history impacted so many people for such a long time—and you can argue about whether his impact was always good. But what a presence in the lives of so many, in so many countries. r. All the best to Tom Benson as the 90-year-old Saints owner remains hospitalized with the flu. From ninth in Sochi to gold.